Homeowners sold 5 million homes in 2013, a rebound year for the industry that marked the highest level of sales since the housing boom year of 2006. The report from the National Association of Realtors showed that there were 5.1 million previously owned homes sold in the year, up 9.2% from 2012 and up nearly 20% from 2011. December sales were up slightly from November, the first month-over-month rise in the reading since July. Mortgage rates have been rising steadily since hitting record lows in May, raising the cost of purchases for home buyers. The Realtors attributed the full-year gain to rising prices, lower unemployment, a drop in foreclosures and pent-up demand, as well as mortgage rates that are still low by historical standards, even with the steady increases most of the year. The median price of a home sold in the year was $197,100, up 11.4% from the previous year. Rising prices have reduced the number of homeowners who owe more on their mortgage than their home is worth, helping to bring more buyers into the market. Tight supplies of homes for sale are keeping prices high, as the report showed less than a 5-month supply at the end of the year. 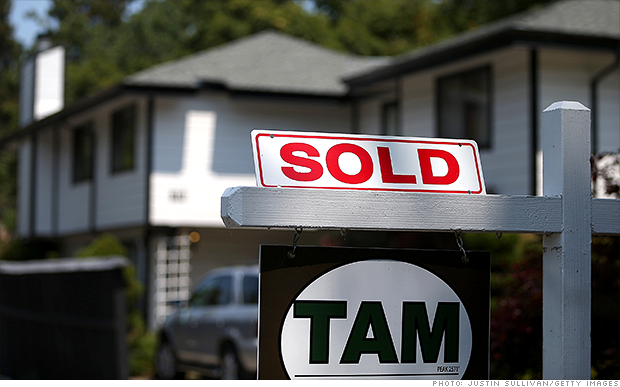 Part of the tight supply is due to the sharp drop in distressed home sales. Only 14% of the homes sold in December were in foreclosure or were short sales for less than the amount owed on the existing mortgage. A year earlier, nearly a quarter of sales were distressed home sales.